NETWORK FINALS: DOUBT, STILL STAR-CROSSED and 20/20: IN AN INSTANT all fell 0.1 in final numbers. CABLE HIGHLIGHTS: A&E’s LIVE PD almost doubled the next-highest rating of the night, up 0.11 from last Saturday to 0.68. (Note, HBO’s KEEPING UP WITH THE JONESES and USA’s BLOOD FATHER were licensed theatrical movie, which the networks per their policy list as “originals”.) Adult Swim’s late-night line-up fared as follows: DRAGON BALL Z down 0.07 to 0.35 (the primetime episode was down 0.02 to 0.26), ATTACK ON TITAN down 0.03 to 0.31, TOKYO GHOUL down 0.03 to 0.26, LUPIN THE 3RD down 0.02 to 0.22, HUNTER X HUNTER down 0.03 to 0.24/555K, NARUTO down 0.03 to 0.20/504K, and GHOST IN THE SHELL down 0.03 to 0.17/442K. Travel Channel’s GHOST ADVENTURES rose 0.07 to 0.34. ID’s FATAL VOWS climbed 0.05 to 0.30. FXX’s coverage of the CONCACAF GOLD CUP match was at 0.27. On HGTV, BEACHFRONT BARGAIN HUNTERS slipped 0.02 to 0.27, and HOUSE HUNTERS RENOVATIONS was down 0.07 to 0.25. ESPN’s morning WIMBLEDON coverage was at 0.25. HBO’s BOXING, rated in segments as usual, was at 0.24/0.24/0.22/0.21/0.21/0.18/0.13. Cartoon Network’s 7:30AM JUSTICE LEAGUE ACTION was at 0.23. On Food Network, KITCHEN AT FN was steady at 0.21. Hallmark’s original movie THE CHRISTMAS CURE was at 0.21. On Spike, JAIL: BIG TEXAS fell 0.04 to 0.20, and COPS dropped 0.09 to 0.17. 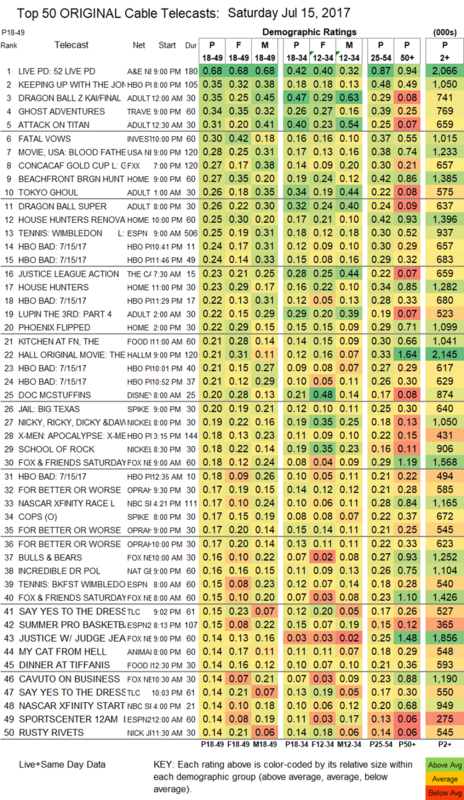 OWN’s FOR BETTER OR WORSE aired 3 half-hours all at 0.17, compared to last week’s 0.15/0.14/0.11. AMC’s TURN ticked up to 0.11. BBCAmerica’s ORPHAN BLACK held at 0.07.